There are countless tools that aim to make it easier to manage your email; but if all you're looking for is a way to see who's really sending you an email, then check out this Gmail Sender Icons. 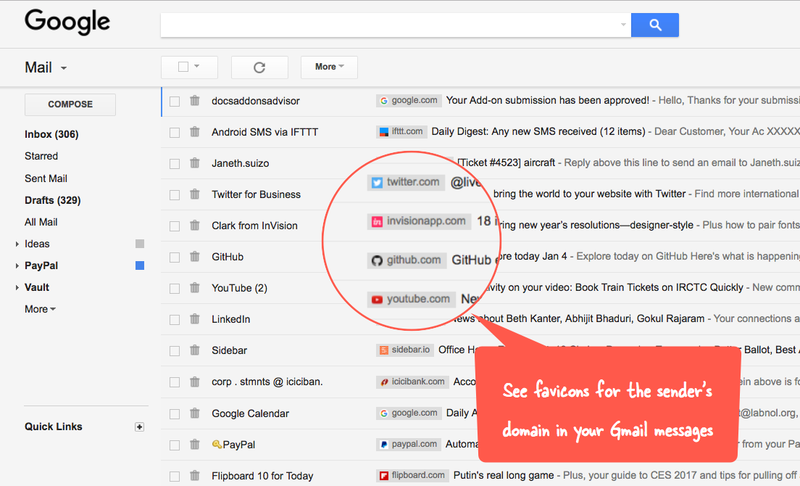 I can't quite understand why Google and Gmail now try so hard to hide the actual email addresses from users. Sure, it may seem nicer to have an email sender shown as simply "john"... until you get a bunch of emails from different "john's" at different companies, and have no way to identify them at a glance. That's what Gmail Sender Icons can help you with. This extension scans your emails and fetches the favicon from the domain sending it - which for most cases, will result in their company logo. So, should you have an email from john@microsoft.com, you'll be able to see a label right next to it, with MS logo and domain name; right next to another "john" that may be reaching you from a completely different company. This extension does all its work locally on your browser, and no data is sent anywhere - as you'd want for any app dealing with your email. More so, it doesn't really affect the speed at which your emails are shown on Gmail. One extra use for it, is to quickly scan your spam folder, and easily find any potential badly assigned email that got thrown there.